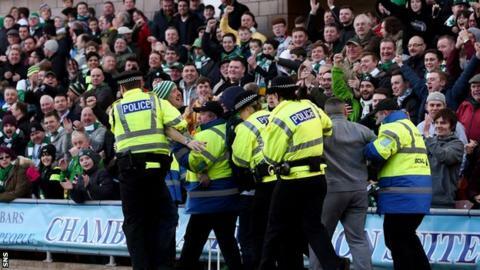 Organised hooligan gangs have attached themselves to two-thirds of Scotland's senior clubs, say Police Scotland. And only seven of the 42 SPFL clubs are categorised as having no risk supporters. A BBC Scotland investigation also found police are concerned by a return of the 'casual culture' prevalent in the 1980s and 1990s. The Scottish government has issued a total of 579 football banning orders since their introduction 10 years ago. "It's fair to say that in the last couple of years we have seen a resurgence in the casual hooligan element," said assistant chief constable, Bernhard Higgins. "In the last two seasons we have had a number of very high profile incidents where fans have clashed a mile away from the stadium or clashed two-and-a-half hours before a match. "People can get in touch with each other much easier through social media and through mobile phones. "If you look at the European scene there's been a resurgence in the Ultra fans groups, so that might be percolating down to Scotland. "I have to make it clear though that the vast majority of games pass off without incident." SPFL chief executive Neil Doncaster is also keen to stress that point and highlights the work being done to make stadiums safe places. "We strive continually to improve in this area and help make the game as accessible as possible for all generations, with designated family areas and positive initiatives such as free tickets for young people common across many of our clubs," he said. "We are very clear in the message that anyone who doesn't behave is not welcome at or around our stadiums and, indeed, these people are not entitled to call themselves football supporters. "As a wider, societal problem only a collaborative and thoughtful approach can begin to tackle the unacceptable behaviour which these people choose to indulge in, not to mention the issues behind them happening in the first place. "Scottish football has a part to play in this - tens of thousands of great people attend our matches every week and they are a force for positive change." Earlier this month, the SPFL recruited Karyn McCluskey, of the Scottish Violence Reduction Unit, in a non-executive director role. And the governing body has set up a working group to examine the issue of unacceptable conduct. However, one former football hooligan believes the current problems pale in comparison with days gone by. "In the 1980's you had young men coming from urban areas into city centres to cause large scale disruption involving CS gas, petrol bombs and knives - a huge gang culture," explained Bradley Welsh, a once notorious casual who followed Hibernian. "What you have now is a bunch of young middle class lads wearing designer clothes and going along seeking high-jinx for self-esteem - there's a huge difference."